We can’t be sure precisely when Australia’s major political parties lost the public on the issue of offshore detention, but the morning of August 20 confirmed it. It was day one of a planned three-month Kids Off Nauru campaign, initiated by World Vision, and it began with Rupert Murdoch’s conservative tabloid newspapers firmly on the bandwagon. That morning, Sydney’s Daily Telegraph ran a heartwarming picture of a young child, born into detention on Nauru, on its front page. Inside, across two pages, there were more pictures, along with an emotive account of the lives of the “stateless babies” and the other “unseen children” living in mouldy tents, sharing dirty bathrooms, playing with donated toys on the “rocky remnants of a phosphate mine and staring through the wire fences of the camp”. The same piece ran on the front of the Adelaide Advertiser and, inside, in Melbourne’s Herald Sun and Brisbane’s Courier-Mail. This was a big development, though not so much because it indicated the Murdoch empire was setting out to shift public opinion on the indefinite detention of children. The piece amounted to an acknowledgment that pubic opinion already had decisively shifted. In the months before that story ran, the source said, editorial decision-makers at News Corp had divined that popular opinion was rapidly shifting on offshore detention, and that they should start shifting with it – for business as much as for humanitarian reasons. Like political parties, populist media is poll-driven. And so, when World Vision came to them, offering an on-their-own story about the children on Nauru, News Corp ran with it. The story carried an “exclusive” tag and the byline of Jennifer Sexton, who was handpicked by Ruth Lamperd, news editor at World Vision, because she was “a good, straight reporter”. Lamperd and her team had done a lot of legwork to pull the story together, calling in favours from its network of contacts developed over the past five years on Nauru. World Vision had been planning for that day – the launch of the Kids Off Nauru campaign – for two months. Pictures and video of the kids on Nauru were taken “by a person who won’t be named and can’t be known”. They organised for the families of the children to give their informed consent for the use of the images. They provided the quotes from the families about the kids’ mental and physical health concerns. The Morrison government is insisting none of the children or their families transferred from Nauru to Australia in recent weeks will be allowed to stay in Australia. Home Affairs minister Peter Dutton confirmed the children were only being transferred to Australia for temporary medical care and would not be allowed to stay. 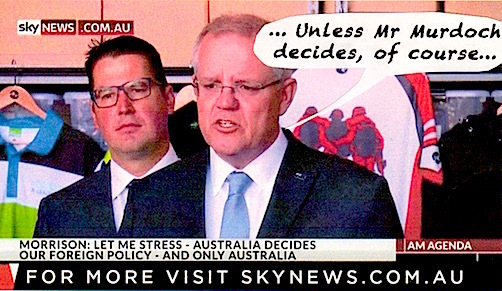 That's in line with a long-held policy, also supported by Labor, that no asylum seekers who come by boat will ever be granted permanent residency. Dozens of asylum seeker families with children have been transferred in recent weeks, with many coming to Adelaide. The government is reportedly planning to get the remaining 38 children off Nauru before the end of 2018. Some of the people held on Nauru have already been found to be genuine refugees, while others have been refused or still have pending applications. Regardless, none will be allowed to settle in Australia. "That is the case and our policy hasn't changed," Mr Dutton told Sky News on Thursday. Ever since Scott Morrison was sacked from his job as managing director of Tourism Australia in 2006, the reasons for his dismissal have been kept secret. Searches, including by AusTender staff, have failed to locate them on the site this week. Procurement rules say they must be reported within 42 days of the contracts being entered. The 2005 request-for-tender documents announcing the proposed contracts are listed. Government records show the ANAO audit was first proposed in July 2006. It is believed to have commenced in the second half of 2007, while the Howard government was still in office and before the November 2007 election in which Labor defeated the Coalition, and former New South Wales Liberal Party director Scott Morrison entered parliament in the Sydney seat of Cook. Morrison began at Tourism Australia in November 2004 and left 19 months later. The ANAO audit covered the 2005 pre-contract period to mid-2008 and documented a series of governance failures at the agency, which coincided with Morrison’s time at its helm. The report does not mention Morrison by name or position, nor apportion blame to any individual but rather to Tourism Australia as a whole. The chairman of its board at the time was former deputy prime minister and Nationals leader Tim Fischer, who is currently undergoing treatment for leukaemia.